Really sad news today. 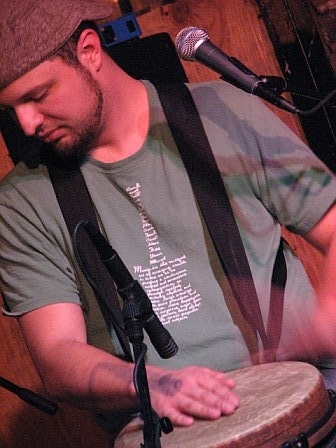 The former drummer from Sam Thacker’s band, Lance Tilton, passed away in a car accident early Thursday morning. An incredibly talented musician, gone entirely too soon. I only met him a handful of times, but it still breaks my heart. Hope there’s a big old drum kit in heaven, Lance. Rock on. This entry was posted in Life in general, Music and tagged atlanta music, lance tilton by Krissie. Bookmark the permalink. I remember Lance – this makes me very sad. Way too young and talented – may he rest in peace. Thanks for being a fan of my brother, Lance Tilton, as a person & musician. In case you write follow up articles, I thought I would let you know that we (Lance’s family & dearest friends) have started a Foundation called the Lance Tilton Foundation- now active. Please visit http://www.LanceTiltonFoundation.org for more information. We are in the fund raising stages currently and are accepting donations & have great quality t-shirts for sale through the website. The LTF has the support of 56 national & local musicians. The Purpose: The purpose of the Lance Tilton Foundation is to provide funding for selected students to continue their musical education and instruction by highly qualified instructors. Donations raised by the foundation will be used to fund music instruction. The LTF is currently applying for 501 (c) (3) status. Who we serve: This program is available for 12 – 16 year old students whose parents/guardians, due to hardship, cannot afford to pay for continued music education. Children selected by the Foundation must have had music instruction in the past and shows a high level of interest in pursuing music. Instrument Donation: The Lance Tilton Foundation also collects new or gently used donated musical instruments, pro audio gear and music supplies. The Foundation will keep music alive in our community and schools by donating musical instruments to deserving students and under-funded music program. If you have any questions, please contact me anytime: 469-767-4735. If you write something about our Foundation, please let me know and I’ll add to the LTF news & press section of the site.